Think about what would happen if the nose fell off and got caught under the front wheel. The wheel would lock up. It would no longer steer. You would go down fast. It would hurt. You gotta hand it to Vic. 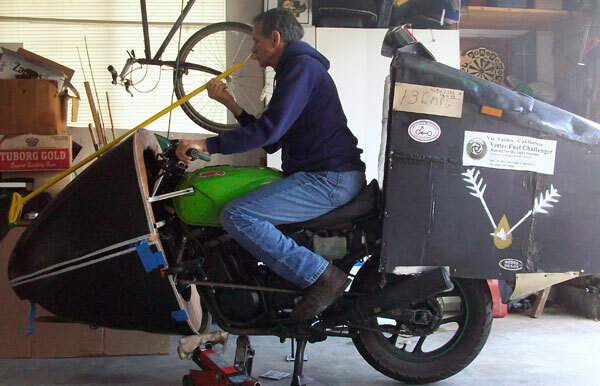 He put his first 250 Ninja Streamliner togerther on a shoestring and old Coroplast political signs. Vic rode from California to Mid Ohio and back like this. 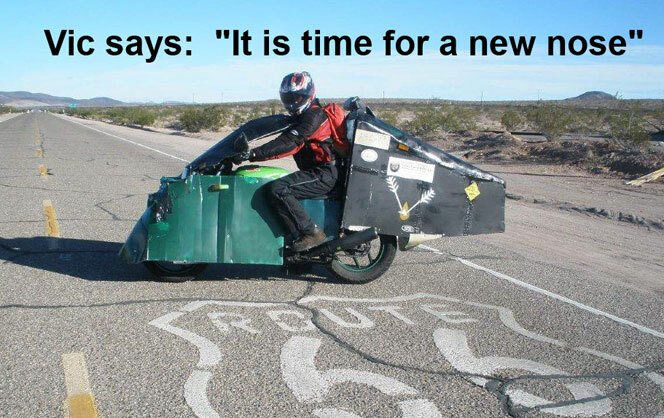 He even rode the Las Vegas to Barstow Challenge. He scared many of us that could see his bodywork fluttering in the wind. It was time for a real nose. Vic bought the same nose parts as on my Helix and Alan's Nnja. 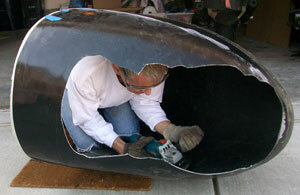 I thought you would like to see Vic make his Streamlined Vetter Nose. Draw a centerline on each half. Make the shape symetrical by folding it in half and halve again. Cut a "compromise" line. 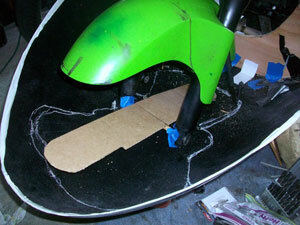 Remove enough of the middle of the plywood bulkhead to clear the forks, frame, etc. 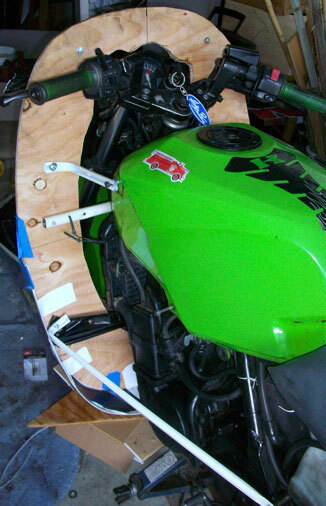 Remove the front wheel and prop up the taped-together nose halves in place. Move it around until you get it right. Rotate it to suit. You may have to separate the two halves and add a gap at one end. Make some temporary brackets to hold the bulkhead. Sit on your bike... move the nose around until it seems right. Twist the throttle and say: Rummm Rummmm rummm. Get off and stare at it. Keep full lock-to-lock. You are not at Bonneville. You need full steering. Make a template of the front wheel profile. Hot melt the axle on it. Turn the forks full lock. Draw a line around. This will be your wheel opening. It looks like Vic cut the wheel opening hole from the inside. It is hard to cut from the inside. I drilled a bunch of 1/8" holes from the inside on the line. Then, after I bonded the parts together (so it would have more structural strength) I cut the opening from the outside following the holes. Vic has first Pop Rivited strips of aluminum into the inside to force the two fi glass pieces together, makng them fit as good as possible. 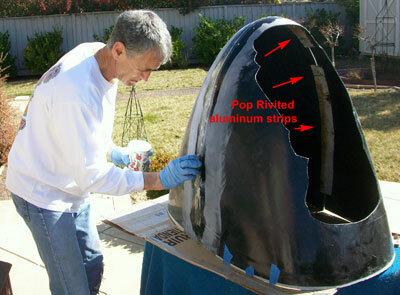 Use aluminum Pop Rivits. Then he sanded the outside down to "feather" the edges. This allows him to end up with a substantial thickness of a fiberglass band for strength. 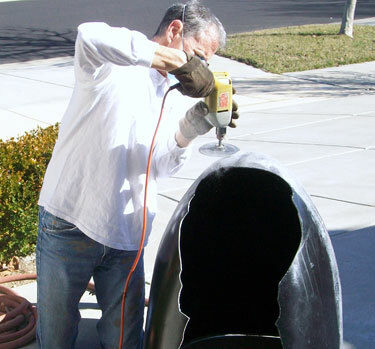 For fiberglass, I suggest you simply buy a kit from Ace or Orchard Supply. That is about all you will need. Once the 'glass has hardened, drill out the Pop Rivits. Aluminum Pop Rivits drill out easy. Then lay up a layer of 'glass to strenghten the inside seam. Vic finishes with a sanding disk. Not difficult at all. Vic says: "! cut out some openings for the headlight and cooling intake early last week, attached the nose and did a short rode test. I needed to do some trimming for tire clearance but everything else was fine. i then started making the framework to mount my side panels and windscreen ( coroplast for now ) and this went pretty fast. I was able to do some ride with everything in place and it feels great. I mounted my turn signals yesterday. I need to trim back the side panels around my legs so that I can get my feet down more easily. I also need to finish the headlight opening and the cooling intake/ ducting. "! 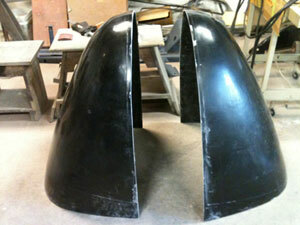 finished getting the new Vetter fiberglass nose mounted on my bike. I still need to do some more finish work such as sealing the plywoood bulhead and adding ducting but I wanted to see how the new nose felt and performed. I started using it to run errands to ensure it was strongly attached and that the turning clearance was OK. Engine temps are good although the weather has been cool. The bike is quieter through the air and I'm hold top gear longer and at smaller throttle openings than before. Alan got back from Phoenix with his "new" (2004 model) stock Ninja 250 and wanted to do a baseline test on our 100 mile test loop. So we decided to ride this morning. Alan's friend Ken joined us with his new Honda CRF250L. We enjoyed the ride through the backroads between Livermore and Patterson and has excellente Mexican food for lunch. 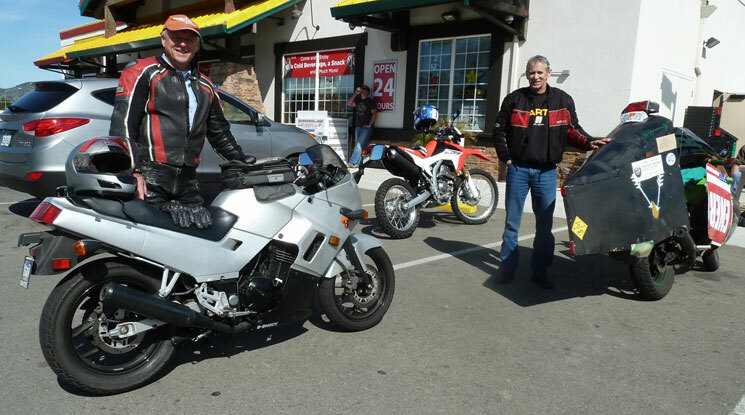 We rode back to our starting point gas station and refilled our bikes: Alan: 77 mpg, Ken 83 mpg, Vic 100 mpg. The weather was cool with some wind. A good start for this current version. 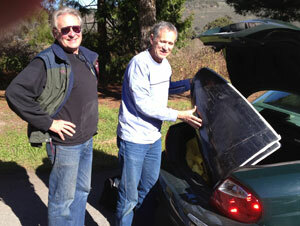 March 10, Alan Smith adds: Just a couple of comments on today's test ride. First Vic was top dog on this informal economy gas run 100 MPG, congratulations. The fuel economy between my "new" 2004 Ninja 250 (12,900-miles on it) and Ken's 2014 Honda CRF250L (600-miles on it) was much closer than I thought it would be, Alan 77 mpg vs Ken 83 mpg. Both bikes were stock. It should also be noted that I did not lay down on the gas tank during the entire ride. I wanted to get a baseline gas mileage on the stock Ninja 250. 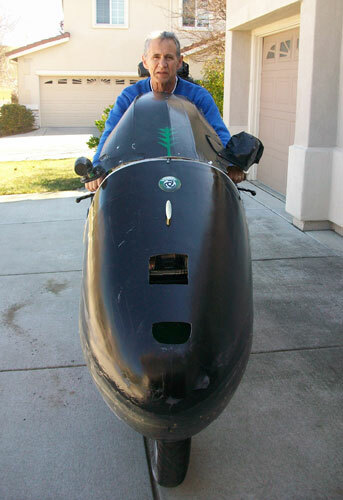 Ken said that he laid down on the gas tank about 80% of the ride, tire pressure 32 pounds front and rear. With today's results I think the Ninja 250 is still a viable contender in the motorcycle fuel economy contests. At least until Charly or Fred's diesel powered motorcycle shows up. For those that don't know it I picked up a very clean 2004 Ninja 250 for $800.00. This bike will be my test mule for engine development and eventually the next generation streamliner. I think it will take a year to get the next bike built. 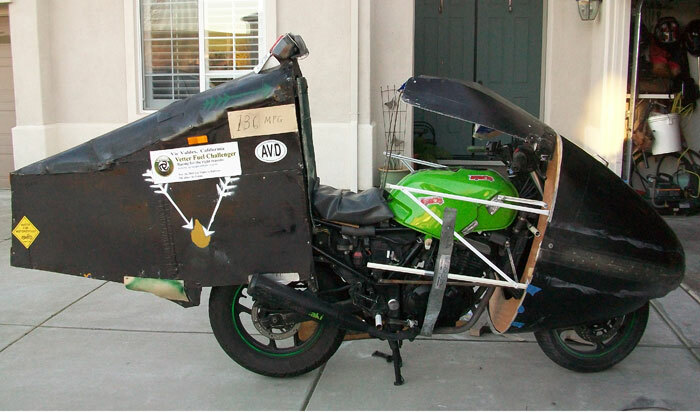 I still plan to compete with my 2005 streamlined Ninja 250 this year. Ken, thanks for coming out to ride with us. As I get more info, I will add it to this page.